Heard that quote in my favorite film at 23 years old and fresh to Los Angeles. It had such an impact on me that it prompted my next three international adventures to South America and remained close to my heart since that day that english subtitles ran along the bottom of the big screen. In Kigali, Rwanda I entered with the mindset to listen and remain present. As I wandered through the streets I couldn’t help but wonder every time I looked in someone’s eyes, how were they directly influenced by the 1994 genocide? 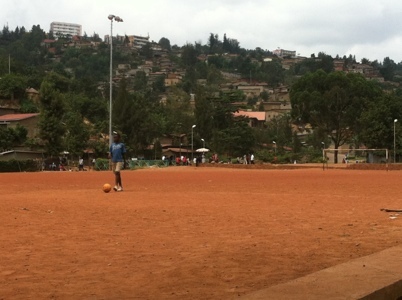 My first stop was the center for Esperance, or ‘hope’ in central Kigali. There I met a staff of four men, two full time and two volunteers, who have dedicated their lives to offering young men and women the opportunity to use sports as a means to learn about competing for life. Every day, over 4,000 student athletes head to the local pitch, which does not showcase one single blade of grass, only rocks and dirt. But they don’t flinch, they kick around a beat up soccer ball with smiles on their faces and kindness in their hearts. This kindness is embedded in their culture as well as taught to them by this staff, who weave hope and life skills into their daily curriculum. Each team of 8 must consist of at least 3 females and at all times, every team must have two women on the field. Furthermore, the goals that actually count in the match must be score by the females. There are also no referees, the players call their own game. Can you imagine that in high school sports? If an issue arises, everyone learns from it due to conflict management training, as the game is halted and the problem is dealt with on the spot, in front of their teammates, peers and loved ones. To impress us even more, the global fear of public speaking is also addressed by the new generation of coaches for this next generation of athletes. Don’t think i changed the world today but did get to witness her spreading Esperance. And that was a gift unto itself. Great story. We need more people like this. Get them a new soccer ball.